Own a 4K Ultra HD TV? The Apple TV 4K can deliver gorgeous images with all the clarity, brightness, and natural color it was meant to display. You'll enjoy Ultra High Definition video, including HDR (High Dynamic Range) content that goes a step beyond mere 4K. And the Apple TV 4K can output lifelike, high-resolution Dolby® Digital Plus surround sound to your compatible home theater system. And that's just the start. The Siri Remote also has a cool Glass Touch interface, so you can swipe, scroll, navigate, rewind, and fast forward just as you would on your smartphone. The Siri Remote has both infrared (IR) and Bluetooth control. Via Bluetooth, your Apple TV 4K will pick up the remote commands no matter where you are in the room. Comfortable using your iPhone® or iPad®? 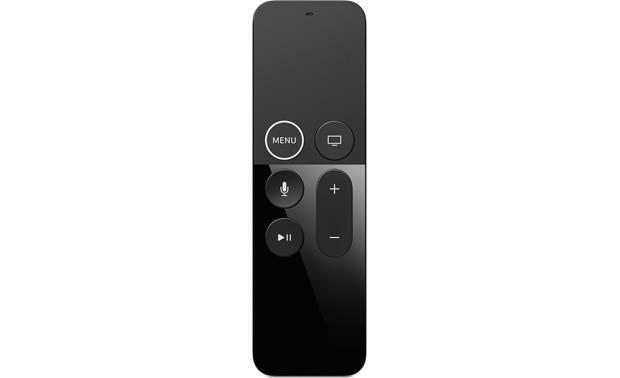 Download the Apple TV Remote app and control your Apple TV 4K directly from your device. The system also lets you control your HomeKit-enabled smart home devices through the Apple Home app. Swipe with your thumb as you view the menus on your TV. Like sports? NBA, NHL, and MLB apps can be accessed through your Apple TV 4K — including live games. Enjoy over 40 million songs and music videos with a subscription to Apple Music. You can also play music from your iTunes library, and of course stream music from your iPhone or iPad. You can also choose from thousands of internet radio stations from around the world. Apple TV 4K has Apple AirPlay, so you can share content from your iPhone®, iPad®, iPod touch® or computer running iTunes®. AirPlay Mirroring lets you display your Apple portable device's screen on your big TV — great for sharing the latest viral videos and images with your family and friends. When you update the firmware of your Apple TV to Apple's tvOS version 11.4 (or higher), the device becomes compatible with AirPlay 2, which will allow multi-room audio playback on compatible speakers. Love the Apple TV 4K, love the 4K resolution on my 65" Samsung TV and love the Dolby Atmos sound on my Onkyo receiver! Recommended if you love Apple! Why does this AppleTV 4K come with a USB cable and it has no ability to connect to it? It is a service port to flash the program at the factory, no use for the user. Apple TV 4K: With Apple TV 4K, you can stream movies, TV shows, music, and games from iTunes and other online services via your home's WiFi network to your HDMI-connected TV. Apple TV 4K lets you watch movies and shows in amazing 4K HDR quality on a HDMI-connected Ultra-HD TV. You also get access to your own personal music, video, & photo collection on your Apple iOS device and iCloud account for playback on your TV. A10X Fusion Chip with 64-Bit Architecture: The new Apple TV 4K features the powerful 64-bit A10X chip. The A10X chip provides a powerful platform for enjoying richer, more interactive apps; while sustaining a consistently high level of performance. tvOS 11: Apple TV's tvOS 11 operating system leverages many of the same frameworks, technologies, and concepts that you are already familiar with for Apple's iOS found in iPod touch, iPhone, and iPad. It enables Apple TV to squeeze maximum performance from its A10X chip, making your experiences on the new Apple TV 4K more lifelike and exciting than ever. TV Shows & Movie Apps (in 4K HDR): The new Apple TV 4K features a built-in App Store making it more entertaining than ever. Through apps, Apple TV 4K gives you access to the most riveting entertainment content. Apps like Netflix, Hulu, and iTunes have full catalogs of hit movies and TV shows. HBO NOW and SHOWTIME bring you Hollywood blockbusters and original series. iTunes: Apple TV 4K makes it easy to catch all the latest entertainment on iTunes. You can buy or rent movies from the iTunes Store in high-definition (HD) or 4K resolution formats. These videos might also feature high dynamic range (HDR) in HDR10 or Dolby Vision. You also have access to single episodes and full seasons of popular current and vintage TV shows. Many movies are available the same day they come out on DVD, and TV shows are available the day after they air. More Apps: Netflix and Amazon Prime Video offer TV shows & movies that can be streamed in 4K. High Definition apps include HBO GO/HBO Now, Showtime, & Starz - providing on-demand platforms of favorite HBO, Showtime, and Starz movies and shows. With a subscription to Hulu, you can watch current and previous seasons of TV shows from ABC, Fox, NBC, Comedy Central, MTV, The CW, and Univision (all in high-definition). In addition, there are dedicated apps for broadcast networks like ABC, CBS, Fox, NBC, and PBS (all in high-definition). You also get access to YouTube videos in high-definition. To stream content in 4K from iTunes, Netflix, or another source, Apple recommends that customers have a minimum connection speed of 25Mbs. If an internet connection isn't fast enough for transferring 4K content, Apple will downscale the video quality. 4K content limited to streaming; Apple does not allow users to download 4K content from iTunes. Apple TV 4K does not support the VP9 format, which means it does not support YouTube in 4K. Music & Radio: Apple TV 4K gives you access to Apple Music and your My Music Library. Apple Music: Apple Music gives you access to over 40 million songs on your Apple TV 4K. So you can use it to explore, and discover great music with family and friends. Discover your next favorite song, album, or artist - without ever hearing an ad. 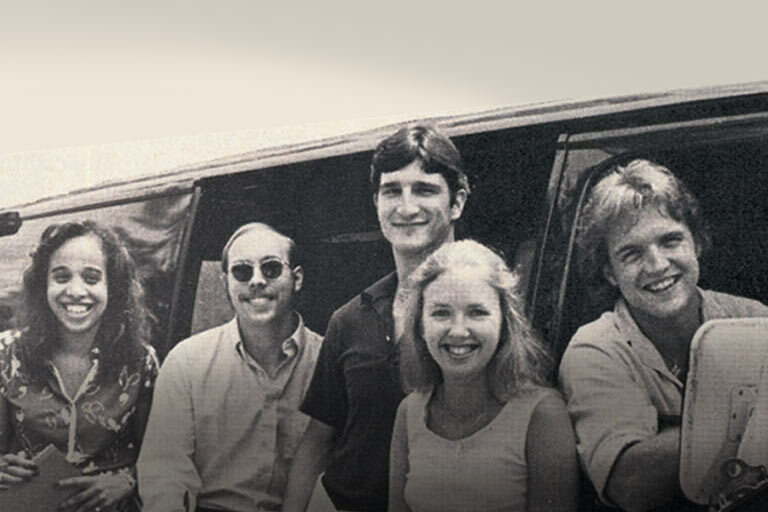 Play anything in the vast 40-million-song catalog, along with your entire iTunes library. You can listen online or off - all for $9.99 a month. Massive Music Collection: The massive Apple Music catalog is home to millions of songs, artists, and albums. And everything in your iTunes library - no matter where it came from - lives right alongside it. All organized as one big music collection. Ad-Free: Whether streaming your favorite song, album, mix, or playlist, your music will never be interrupted by ads. Off-Line Mode: If you don't want to use your cellular data, you can download anything from Apple Music and listen to it right from your phone. No signal required. Beats 1 Radio: With up-and-coming artists and daily curated playlists, Apple Music is always bringing you content that's new and noteworthy. Listen to Beats 1 radio, and if you have a specific music request, just ask Siri. Playlists: Be your own DJ by easily making a playlist of your favorite songs. Or let Apple Music create mixes for you based on the music you like the most. Music Sharing: Create a profile and follow friends to see what they've been playing, and share what you're into. My Music: Listen to music from your iCloud Music Library, including music you add from Apple Music, your iTunes purchases, and songs uploaded from your computer, along with your iTunes Match library. News & Sports Apps: Apple TV 4K offers the live content you care about most, including news and sports. You'll find your favorite sports from apps like NBA, NFL, NHL, and MLB, plus ESPN. You also get late-breaking news from apps such as Bloomberg and CNN. Videos & Photos: Apple TV 4K lets you use your "My Photo Stream" and "iCloud Photo Sharing" to view the photos and videos shared from your iCloud account on your connected television. You can choose to view your photo albums as a slideshow with Apple TV 4K. The "Memories" feature automatically creates collections of your best photos and videos, and Apple TV lets you see them in 4K. If you create Live Photo loops or bounces on your iPhone, you can share those on the big screen, too. You can even use one of your photos as the Apple TV 4K screensaver. My Photo Stream: Turned on by default on your iOS devices, My Photo Stream automatically uploads new photos taken on an iOS device to your other devices that use My Photo Stream, including Apple TV 4K. iCloud Photo Sharing: You can view albums of photos and videos shared from another iOS device or Mac using iCloud Photo Sharing, or view other people's shared albums if you're subscribed. Gaming: The same Siri remote you use to watch Apple TV 4K can also be used to play video gaming apps that are available on Apple TV 4K. The Siri Remote doubles as a dynamic game controller, with the Touch surface acting as a virtual directional pad. It even has a built-in accelerometer and gyroscope. The new Apple TV also supports MFi-based controllers (sold separately) that let you run, jump, shoot, kick, throw, & punch. Storage Management: Apple TV 4K streams video and music, but it stores apps locally. The more apps you download to Apple TV 4K, the more storage is used up. At some point you may get a warning that you're running out of disk space. If so, you can remove apps to free up space. Customizable Home Screen: The top row of the Home screen is a great place for your favorite apps. When you highlight an app in the top row, you get shortcuts that can take you to content without opening the app first. You can decide which apps appear in the top row, arrange them in the order you prefer, and delete apps from the App Store that appear on the Home screen. You can also change the appearance of backgrounds and menus between light and dark. Cinematic Screen Savers: When you're not actively using Apple TV, it displays aerial HD videos of stunning locations around the world on your TV screen. Shot specifically for Apple TV 4K, these dreamy landscapes drift across your TV, turning your big screen into a mesmerizing work of art. Accessibility: A variety of accessibility features help you get the most out of your new Apple TV. If you are blind, have low vision, or are deaf or hard of hearing, you can easily find and enjoy your favorite entertainment. These accessibility features include VoiceOver, Zoom, Bold Text, Increase Contrast, Reduce Motion, Closed Caption & SDH Support, and Accessibility Shortcut. Auto On & Sleep: Apple TV 4K is ready for you to watch at any time, and automatically goes to sleep after a preset period of inactivity. 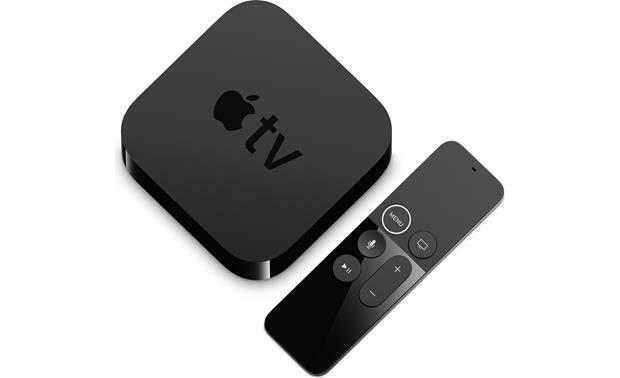 Wired & Wireless Network Connectivity: Apple TV 4K offers both wired (Ethernet) and wireless (WiFi) network connectivity. It is equipped with an Ethernet (RJ-45) port which supports a 10/100BASE-T Ethernet wired network. It also features built-in simultaneous dual-band (2.4GHz/5GHz) WiFi (802.11ac) with MIMO that supports a wireless WiFi network. Note: You can transfer your WiFi network and password and Apple ID account information automatically to Apple TV 4K from your Apple iPod touch/iPhone/iPad with iOS 9.1 or later. 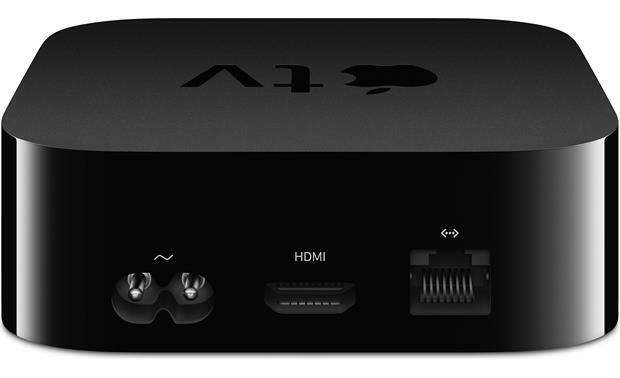 HDMI 2.0a: Apple TV 4K is outfitted with an HDMI 2.0a output to connect to your Ultra HD TV & home entertainment system. The App TV's HDMI output supports up to 4K/60Hz video, HDR video (including HDR10 & Dolby Vision), as well as 7.1 multi-channel audio (including Dolby Digital Plus). 4K/60Hz Ultra HD: 4K provides 4x higher resolution than 1080p high-definition with a total of 8.3 million pixels. Its detail is so vivid and crisp, even when viewed from close distances; it's nearly impossible to discern a single pixel, even from inches away. Enjoy incredibly flawless images, vivid colors, and picture details as never before. HDR (High Dynamic Range) Video: HDR reproduces a greater dynamic range of luminosity or brightness levels, bringing greater contrast & wider color spectrum to the screen. This increased contrast reveals the subtle nuances of the image, from detailed blacks and shadows to the brightest whites and colors, plus greater depth. Previously hidden areas of dark shadow and sunlight are now full of clarity and detail. The Apple TV 4K supports HDR10 and Dolby Vision HDR formats (does not support HLG). HDR10: HDR 10 is an open standard and currently the most popular HDR format on the market. It uses static metadata at the start of a movie to tell the receiver and your TV that the video content is encoded using HDR. Dolby Vision: Unlike HDR 10 which contains static metadata, Dolby Vision adjusts brightness, color, and contrast automatically for each scene. Dynamic metadata carries information that maps every image to your TV's display capabilities, so you see more of what the content creator intended. As a result, Dolby Vision delivers incredible brightness, color, contrast, detail, and dimensionality. Multichannel Surround Sound: Apple TV 4K offers support for Dolby Digital Plus & Dolby Atmos surround sound formats. Dolby Digital Plus: Dolby Digital Plus delivers up to 7.1 discrete channels of high-fidelity surround sound. home theater system. Dolby Atmos (requires iOS 12.0 update): Dolby Atmos moves sound all around you in three-dimensional space, so you feel like you're inside the action. Rather than being constrained to channels (like many other surround formats), Dolby Atmos can precisely place different sounds and move them in three-dimensional space. Dolby Atmos creates a new sensation of height that immerses you in the action, creating a full audio atmosphere and realistically depicting objects moving overhead. Dolby Atmos renders everything from dialog to quiet scenes to whirlwind action with astonishing clarity, richness, detail, and depth. It all comes together in sound that excites your senses and inspires your emotions to deliver the full impact of entertainment. Note: Some soundbars and AV receivers support Dolby Atmos, but don't support video formats like HDR10 and Dolby Vision. In this case, you can either plug your Apple TV 4K into the soundbar or AV receiver to play sound in Dolby Atmos. Or you can plug your Apple TV 4K into your television to watch video in HDR and Dolby Vision. To do both, you need a television or an AV receiver or soundbar that supports both Dolby Atmos and 4K/HDR video formats. Apple TV 4K uses a high bandwidth form of Dolby Atmos that doesn't work over ARC connections. AirPlay 2 & Mirroring: The latest 11.4 iOS software update allows Apple TV 4K to support AirPlay 2, an advanced and easy-to-use wireless multiroom audio platform. While listening to your music from Apple TV 4K or other AirPlay 2 certified device (like the Apple HomePod), it's as easy as selecting or unselecting where your music is playing in the Control Center of your iOS device or within a compatible music app. You'll also be able to ask Siri to play music in any room, group rooms, or play music in every room. Plus with AirPlay Mirroring, you can display the screen of your iPad, iPhone, iPod touch, or Mac on your TV. Home Sharing: Apple TV 4K lets you access your iTunes account on your Windows PC or Mac, so you can watch & listen to content saved in your iTunes library on your computer from your connected television & home entertainment system. Bluetooth 5.0: With built-in Bluetooth 5.0, you can connect a Bluetooth device to the Apple TV 4K - such as an MFi-certified (made for iPod touch/iPhone/iPad) game controller, Bluetooth headphones, wireless keyboard, and other Bluetooth-enabled accessories. Detachable AC Power Cord: The Apple TV 4K operates off of standard household current using its internal power supply and detachable AC power cord. Siri Remote: The new Siri remote offers both voice & touch-surface control which makes finding what you want to watch on TV fun & fast. Thanks to Bluetooth, you don't even have to worry about where you point the remote; the new Apple TV will pick up your commands from anywhere in the room. Voice Control: There's no easier way to interact with something across the room than using your voice, and now the Siri Remote lets you do that with Apple TV 4K. Dual microphones on the remote allow Siri to hear your commands clearly, even if there's background noise. Simply say what movie or show you want to watch, and Siri finds it for you, without having to click through multiple menus to get there. Siri understands a wide range of commands, and intuitively applies them to the current context whenever possible. Siri doesn't talk back to you on Apple TV 4K like it does on iPhone and other devices, but it'll carry out your request and display the results onscreen. 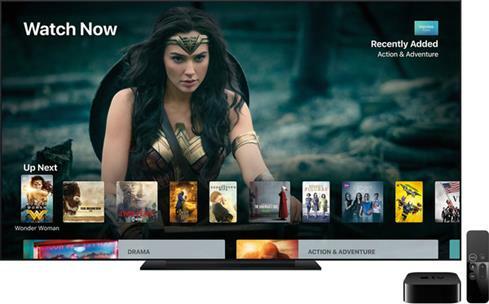 Movie & TV Show Searches: With Siri, you can quickly search for a movie or TV show across popular services, including content apps such as iTunes and Netflix. All your viewing options are displayed on the screen, so you can see where a movie or show can be found. You'll also see if it's available to rent, buy, or watch with a subscription. With Siri, you can continue to make follow-up commands during a search until you find exactly what you want. Other Siri Functions: Siri doesn't just let you search for movies and TV shows; ask Siri to show you sports scores, control playback, pull up the weather, access your settings, and check your stocks. You can even tell Siri to reduce loud sounds, which boosts dialogue and softens music and sound effects, so you don't wake up the whole house when you're watching a late-night movie. Or if you can't understand a line from a show, ask "What did he just say?" And Siri will skip back and temporarily turn on closed captioning, so you can see what you missed. Touch-Surface Controls: The glass Touch surface on the new remote was engineered to provide an experience that feels both fluid and precise. What your finger does on the remote is exactly and immediately what it does on your screen. You can use your thumb to swipe, scroll, select, and easily navigate around your screen. Which means no more endless clicking of arrow buttons to find what you want. You can move your thumb in any direction on the remote's Touch-surface and the action is mirrored on your TV screen. Once you find what you want to watch, simply click anywhere on the glass Touch-surface to make your selection. You can even swipe quickly with a sweeping motion to fast-forward and rewind across large amounts of time. Or swipe with smaller, more precise movements to go almost frame-by-frame. TV & Universal Remotes: You can configure the Siri Remote to turn your TV on or off, change the input to your Apple TV 4K, and even control the volume. You can also use any infrared remote to control Apple TV 4K. You just need to let the other remote learn the signals that the Siri Remote generates. Note: The Siri Remote has a rechargeable battery inside. With typical usage, you'll need to charge it a few times a year. An alert appears on the TV screen when the remote battery is running low. Connect one end of the included Lightning-to-USB cable to the Lightning port on the bottom of the Siri Remote, and then connect the other end to a computer's USB port or to a 3rd party USB/AC power adapter (sold separately). Find Apps: The App Store lets you browse, purchase, and download apps to the Apple TV 4K. Browse a great selection of apps chosen by the App Store (Featured), browse the top items in the App Store (Top Charts), Browse apps by category the top items in the App Store (Categories), and see the apps you've purchased on the App Store; including purchases made on other iOS devices that have a shared Apple TV version of the app, as well as purchases by Family Sharing members (Purchase). 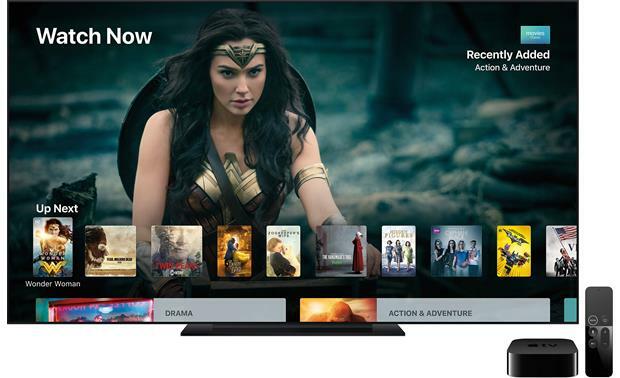 Browse TV & Movies: "Watch Now" includes TV shows and movies you have access to from free services, services you've subscribed to, and your iTunes purchases and rentals. "Library" includes your iTunes purchases and rentals, organized by category. "Store" lets you explore great new content across channels and services you haven't yet subscribed to, as well as the latest releases on iTunes (browse featured movies, TV shows, or content apps). Use "Search" to find TV shows and movies by title, cast, or crew. Apple Music Playback: On the "Now Playing screen", you can quickly navigate to other songs in an album or playlist, or select more options. "Library" includes any Apple Music content and playlists you added, iTunes purchases and playlists you created, and music you make available through iTunes Match. The "For You" feature suggests curated playlists and albums, based on your specific tastes. The "Browse" function showcases the best recommendations from music experts. "Radio: offers the always-on Beats 1, featuring top DJs playing today's best music, as well as a collection of stations based on different genres; stations created by experts provide a great way to explore and enjoy new music - you can also create your own custom stations, based on your pick of artist, song, or genre. You can search Apple Music content by song, album, playlist, artist, curator, music video, activity, radio station, or genre. Or, use Siri to search music. Apple TV App: The Apple TV app lets you browse content from over 60 video services without switching from one app to the next. You'll find movies, shows, and handpicked recommendations. The Apple TV app is already on iPhone, iPad, and Apple TV and works seamlessly across them all. So if you stop watching in one place, you can start again later on a different device. Watch Now: Watch Now serves up your favorite shows. It features Up Next, which lets you pick up where you left off, and What to Watch, where you'll find handpicked recommendations. Search: Find movies and shows by entering a title or actor in the Search tab. Or ask Siri what you are looking for. Note: If you're running a version of iOS prior to iOS 11, download the Apple TV Remote app from the App Store on your iOS device, and make sure your Apple TV, iOS device, and the Apple TV Remote app are updated to the latest software version and connected to the same WiFi network. Smart Home Control via Home App (HomeKit Compatible): Apple TV 4K lets you use your iOS device to control HomeKit-enabled smart home accessories remotely with the Home app. No matter which compatible accessories you choose, the Home app makes it easy to set up and control all of them, all from one place. Over 50 brands worldwide are committed to providing accessories that are compatible with the HomeKit framework, and the number available is growing every day. And each of these accessories is reviewed and approved by Apple to help ensure your security when you use it. Grouping: The Home app groups accessories by room, so you can easily control devices in any part of your house with a tap. You can even tell Siri things like "Turn off my bedroom lights" or "Start heating the upstairs". And 3D Touch lets you press an icon to perform more complex tasks like dimming the lights or adjusting the thermostat. Scenes (Macros): Home allows you to set scenes, which enable multiple accessories to work in combination - all with a single command. So you can create a scene named "Leaving Home" that turns off the lights, locks your doors, and lowers the thermostat. Voice Control via Siri: Siri knows which HomeKit-enabled accessories you have in your home, as well as their status. So you can ask Siri to turn an appliance on or off, dim your lights, change the song, or set one of your scenes. With Apple TV 4K, you don't even have to be home - for example, you can ask Siri to set the "I'm Home" scene while you're driving. When you arrive, your house will be bright and warm, waiting for you to settle in. 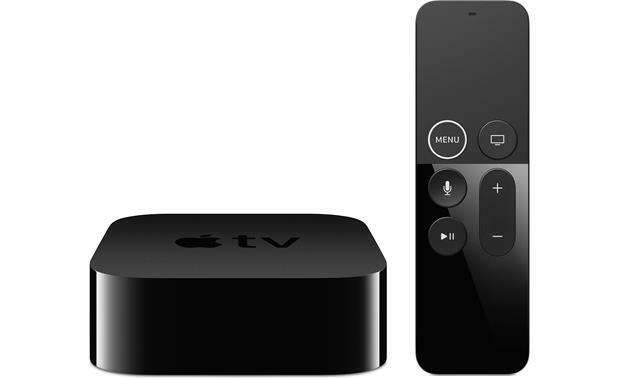 Automatic Tasks Apple TV 4K also enables your home to carry out certain tasks automatically. For example, you can trigger an accessory or scene based on the time of day, your location, sensor detection, and more. Set it up once and you're done. I just purchased a Samsung UN40MU7000 TV. Does the new Apple TV 4K work with it? I have seen some reviews indicating a problem. Can I run the Apple TV 4K through the Oppo 103? Can you download Playstation Vue on Apple TV 4K? Which other Apps are you able to download? Yes, Playstation Vue ia available through the App Store on the Apple TV 4K There are many other apps available like Netflix, YouTube, etc. It is similar to the app store for the iPhone and iPad. Hope this helps. Yes, PlayStation Vue is available on Apple TV. Try Googling, for example, Playstation Vue on Apple TV, etc. to find the Apps you are looking for. Obviously, if you have an Apple TV, use the App Store instead. Can I "screen mirror" movies I downloaded from Amazon Prime on my iPad to my TV? Yes, you can use AirPlay for this, but easier than that you can download the Amazon app directly on the AppleTV and watch directly without the iPad. Yes you should be able to mirror with airplay. I'm guessing you mean can you do so using the Apple TV 4K. Yes, but you can also download the Amazon Prime Video app onto the Apple TV and watch anything included with Prime or purchased by you through that. It's a lightning cable to charge the remote. This to charge the battery of the remote control. The included USB lightning cable is used to recharge the remote. The usb cable is for recharging the remote control unit. It has nothing to do with the ApplevTV box itself. Can I run the Apple TV through my Oppo 103? Sorry, but I really don't know. I run my Oppo strictly as an input device to my Dennon receiver/processor. Not sure what the point of this is, why would you want your Apple TV to be run through a player in the first place? Anyway, the Apple TV only has 1 HDMI out so that is the only connection you will get. What is a good receiver to pair with the Apple TV 4K? Searches related to the Apple TV 4K 4K Ultra HD streaming TV and media player with Wi-Fi®, Apple AirPlay® and Siri voice-activated remote.